Review “United Flight 232” (The House Theatre of Chicago): This is a Plane Crash You Want to Be On! 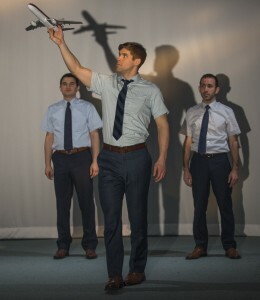 The House Theatre of Chicago presents UNITED FLIGHT 232. I survived the crash of United Flight 232. I wasn’t there on July 19, 1989 when it crashed into a cornfield in Sioux City. I was there yesterday when House Theatre of Chicago reenacted it. 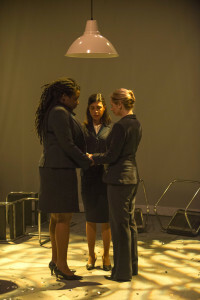 Adapter and Director Vanessa Stalling creates an experience like no other. I was up. I was down. I was in the cockpit. I was in the galley. I was dangling from a DC-10 ceiling trying to unbuckle my seatbelt. And I was crying on the phone with my dad in the National Guard’s Chaplain’s office. That’s the power of this story! The experience takes off immediately. Instead of entering the theatre, we walk down Scenic Designer John Musial’s jetway. Musial built the familiar, narrow corridor that connects an airport to the plane. Inside the theatre, white tent material makes the space intimate, sterile and contained. A singular line of seats runs down the middle of the stage and the audience is on either side. The show starts with a commanding Brenda Barrie playing Jan Brown, the Chief Flight attendant. Barrie narrates the sequence of moments leading to the tragedy. Although the rest of the talented ensemble will play a variety of characters, Barrie remains Jan Brown. She introduces herself and her commitment to an excellent flight service. Barrie explains in crisp professionalism why she always wears pants as her uniform. I’m increasingly glad Barrie is in-charge. Her controlled demeanor gives the passengers and the audience a pretend reassurance. After an engine has blown and the turbulence is increasing, a visibly shaking Echaka Agba (another flight attendant) explains that she did another round of coffee service because a Jan Brown flight always had a second coffee service. It’s these glimpses of real character and authentic reaction to the crisis that kept me transfixed. Before the end of the show, we will hear from many of the survivors of the crash. Author Laurence Gonzales captured the distinct personalities of crew members and passengers. His stories are a collection of heartwarming heroics, end-of-life regrets and the fates that led to the United Flight 232 disaster. 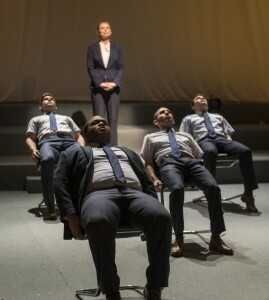 Stalling does an extraordinary job of taking Gonzales’ research and piecing together the tragic flight in a tight, fluid 90 minutes. She orchestrates a poignant musical chairs as seats are uniformly repositioned again and again. This isn’t like an airplane disaster movie. It’s not dramatic to be dramatic. Stalling is an engaging storyteller. She tells us what happened and who it happened to. We even learn about the slim chances of all the hydraulic fluid being depleted. Stalling weaves in the explanation as the pilots use a model plane to show the journey’s movement. I’m riveted. At strategic points, Stalling places a pilot in the audience to make emergency announcements. The choice adds to the palpable intensity. But this show is really about who this tragedy happened to. The terrific ensemble make these survivors real! They often speak directly to the audience in a vulnerable and personal way. They introduce themselves by name and seat number. The passengers then give us a little background on their past: I didn’t kiss my sleeping wife. I’m supposed to play softball tonight. I work too much and neglect my family. The details connect us to the person. What they say and do during this horrific experience tethers us to their spirit. UNITED FLIGHT 232 is a moving tribute to the resilience of humanity. I laughed. I cried. I decided to call my mom from the jetway on my next flight. I also pledged to pay attention to the safety procedures in the preflight. UNITED FLIGHT 232 crashes and burns as an uplifting spectacle. I highly recommend getting a ticket on UNITED FLIGHT 232.